A unique opportunity to learn more about the outstanding personality, former Metropolitan of Kissamos&Selinos, Irineos Galanakis, (November 10, 1911 – April 30, 2013), a visionary with a goal-oriented approach, who helped West Crete to thrive in the fields of agriculture, education, economy and culture. He initiated and founded various companies and cultural institutes and also published more than thirty books on his thoughts and questionings, of cultural and theological content. 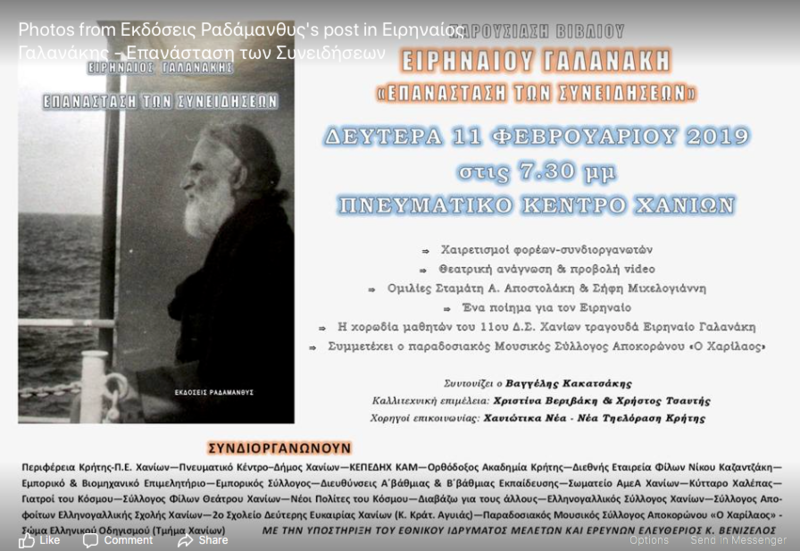 The new book “Revolution of Conscience” (“Επανάσταση των Συνειδήσεων”) contains rare papers by the late Irineos Galanakis and is presented by the Radamanthis Publishing House, with the support of the National Research Foundation Eleftherios K. Venizelos, whose chairman Eirinaios Galanakis was. -Pupils from Chania created, especially for this book, bags of recyclable paper and bookmarks. Bishop Irineos has not only been known for his deeds but also for his warm words and speeches for love, community, solidarity and peace for all people. In Irineos’ case, it was not only about words, according to Mr Kyritsakis. There are numerous charitable associations and foundations, established under his assistance and surveillance. Schools were established by him, offering young people to learn arts and crafts, and schools for the disabled or people with special needs. There are several examples of the practical help he has offered to his fellow citizens and his country. He also founded the Orthodox Academy in Kolymbari. In Kolymbari, Kissamos, Chania and Paleochora boarding schools were built on his initiative, for children from villages in the countryside, who, otherwise, would not have had access to secondary and higher education. In Kolymbari I was told that Eirinaios helped himself with masonry work at the boarding school for Secondary School pupils (Γυμνάσιο). In this building in Gribliana, the old part of Kolymbari, there is the town hall today.